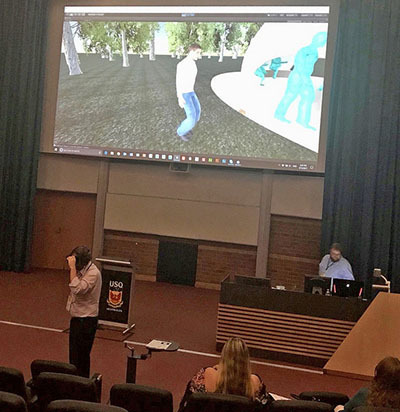 The research project was presented at the recent ASCILITE 2017 conference in Toowoomba, where Dr James Birt provided a demonstration in a mixed reality world. Virtual Reality (VR) and Augmented Reality (AR) are all the rage but how can they be adapted to enhance education or skills development in a group or classroom setting? CQUniversity’s Dr Michael Cowling and his collaborator from Bond University, Dr James Birt, think the trick is preventing students feeling stuck on the outside of ‘mixed reality simulations’. In other words, they won’t get as much benefit if they are just watching someone else have a single-user experience and not being fully immersed in it. “The issue with most mixed reality simulations is that the user is separated from the spectators, wearing the mixed reality hardware and waving their arms about whilst everyone else in the room looks on with confused looks on their faces,” Dr Cowling says. “In this work, we are looking to provide a seamless integration between users and spectators in the mixed reality experience”. The researchers are proposing to road-test a range of approaches to this challenge. For each of their test projects, a user will be asked to perform a simple mixed-reality task, with other participants viewing under a range of different conditions. “The most immersive experience is expected where all learners are using stereoscopic mobile mixed reality hardware, because they will be an integral part of the overall experience,” said Dr Birt. “But it remains to be seen what multi-user mixed reality approach might work the best." Other tests will be run to include multiple spectators via non-immersive POV (point of view); multiple spectators via immersive POV; multiple spectators with POV of the user and PiP (a picture-in-picture view) of the user; and multiple spectators with a non-immersive third-person view (a view of the user enhanced with digital objects from the mixed reality simulation).